We guarantee that your issue will be solved quickly. We usually respond within 24 hours on weekdays. Are you worried that you cat's litter box is ruining your home's look? You love your pet, but hate how their bed or litter box ruins the look of your home. 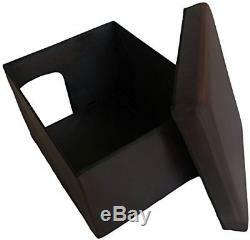 You can now do something about it with this practical cat litter box ottoman and pet bed enclosure! It's your ideal all-in-one furniture solution. The Pet Litter Box Ottoman by Mable Ruth hides that unsightly litter box within an attractive dark brown faux leather furniture piece. These ottomans not only conceal the box but also reduce litter box smell. You can now stop worrying about tucking the litter box away in a corner. With a functioning soft table surface and additional storage space, this animal house becomes a regular working piece of furniture in your home. It doesn't just serve a useful function but this Pet House Ottoman adds to the appeal of your furniture. Acts as a fashionable and stylish ottoman table for everyday use. Very easy to assemble or disassemble and store. Helps prevents odors from slipping out and causing discomfort. High quality materials make it durable and very eye-pleasing. Size: 24" long x 19.5" wide x 16 tall. Alternatively this multi-purpose pet house litter box enclosure can be used for storing items out of sight or provide your cat or small dog with a place to hide and sleep. The construction provides exceptional durability and it's sturdy enough to support up to approximately 175 pounds, so it can double as bench. The versatile design allows the pet ottoman to be folded up for easy storage. This beautiful furniture piece is also easy to assemble and easy to clean. Your ottoman doesn't just have to take up space. Put that space to use with this attractive furniture piece and rest easy knowing that your furry companion has an isolated bathroom or hideaway right under your feet! Multi-Purpose Use Pet House: This Ottoman Pet House hides your cat's litter box or pet bed in a very stylish way. No More Odors: This Ottoman Pet House was designed to keep the odors locked inside as much as possible and makes cleaning the litter box a much easier task to carry out. Stable Construction: Lightweight and sturdy construction supports a variety of pet activity and will support up to approximately 175 lbs, which makes it a nice soft bench as well. High Quality Pet House Litter Box Enclosure: For the maximum comfort of your pet we made the comfortable cushiony top extremely soft and comfortable for pets to have a nap on the exterior. Private & Safe: Much like us, pets need their own safe spot where they can have their privacy for potty time and feel safe in the process. This pet bed friendly enclosed cat litter furniture box provides your pet with a place to call its own and have its privacy. 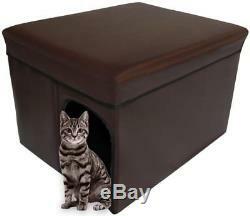 Ottoman Pet House Hidden Litter Box Enclosure & Pet Bed Friendly - Enclosed Box. The item "Ottoman Pet House Hidden Litter Box Enclosure & Pet Bed Friendly Enclosed Box" is in sale since Friday, March 9, 2018. This item is in the category "Pet Supplies\Cat Supplies\Litter Boxes". The seller is "techgirl529" and is located in Johnston, Rhode Island.